Home » How To Start A Low Carb Diet In 3 Easy Steps! Join the thousands of people who will choose a low carb keto lifestyle this month and learn how to start a low carb diet in 3 easy steps! What is the Low Carb Keto Diet and why does it work? A keto diet is a special low carb diet in which the body burns fats for fuel instead of carbohydrates. In the absence of carbohydrates, fats break down into ketone bodies which supply the brain and body with an almost unending and stable source of energy. Keto diets work because they stabilize blood sugars. Lowering glucose levels and avoiding large spikes in insulin is the secret to harnessing stored body fat for fuel (read more about this on Low Carb RN). The result is significant weight loss that’s easily maintained if one sticks to a low carb diet. Following a low carb keto diet is easy. Choose the best quality food you can afford while avoiding grains, sugar and starches, (see my Low Carb Food List) Cook your own food, read food labels, and learn how to order at restaurants. As a rule, carbohydrates are counted instead of calories, however, this isn’t an excuse to get carried away. One of the benefits of keto diets is an increased feeling of satiety – you just aren’t as hungry and may actually eat less. What Is low carb/Keto Flu? The low carb or keto flu is a natural period of adjustment which occurs when the body switches from using carbs for fuel to using fats. The resulting symptoms are headaches, lethargy, and body aches. Symptoms can be remedied by drinking fluids containing electrolytes (bone broth, a cup of bouillon, pickle juice), salting your food, having some caffeine, using coconut oil for cooking, and taking it easy. Symptoms pass within a few days. What are macros? Macros represent the amount of carbohydrates, fats, and proteins at which one should eat, daily. Individual macros are based upon gender, height, weight, age, activity level and body fat percentage. There are many macro calculators available online and I like this calculator from Tasteaholics. Meals and food are planned based upon individual macros. Some people try to “hit their macro” percentages at every meal while others look at their whole day. 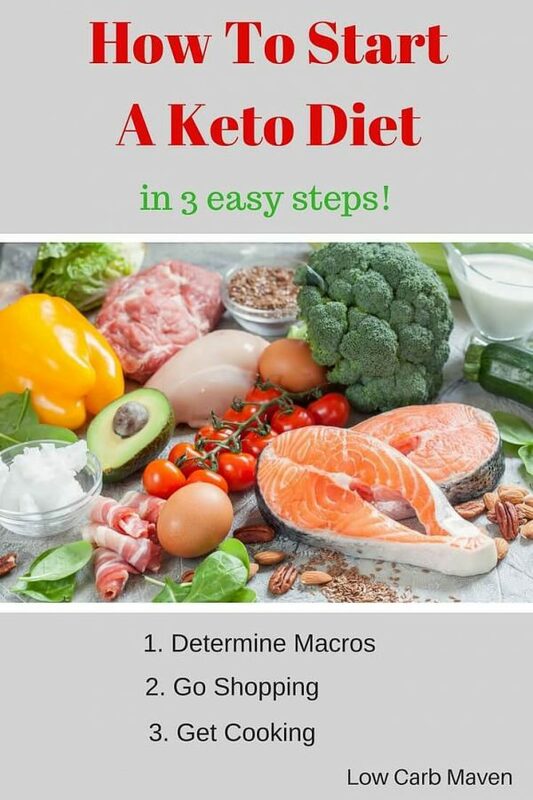 NOTE: You do not have to determine your macros to follow a keto diet. Many people follow a keto diet simply by limiting net carbs to 20 a day while enjoying moderate amounts of protein and liberal amount of fat. To determine net carbs for a particular food, subtract fiber carbs from total carbs. A moderate amount of protein is 3-4 ounces of meat per meal. Enjoy cooking foods in fat, adding cream to coffee, using mayo and full fat dressings, topping vegetables with butter and eating cheese (limit cheese to 4 ounces a day because it does contain carbs). Choose foods that are naturally low in carbs like green leafy vegetables and salad vegetables, full-fat dairy, eggs, nuts, seeds, and meats. Fresh, minimally processed ingredients are best. Processed foods contain sodium, preservatives, and added sugars so be sure to read labels. Look for sugar-free alternatives to condiments like ketchup and barbecue sauce or make your own. You’ll have to decide which sweeteners are right for you and how much you are willing to use. It’s important to read food labels to determine the amount of carbs a product has per serving (subtract fiber from total carbs to determine net carbs). Many foods contain hidden sugars so err on the side of simplicity. Some people like to say, “if my great-grandma wouldn’t know what it is, then forget it.” For a complete list of safe foods see my Low Carb Foods List. Keep things simple for best weight loss results, but simple does not mean boring. Use spices, herbs, and plenty of fat to make food taste good. Cooking and preparing your own meals ensures that you hit your macros and control your carb intake. Protein can be grilled, pan fried, sauteed, or baked. Use enough fat so that your food doesn’t stick to the grill or a pan. One can also find many low carb keto crock pot and electric pressure cooker recipes online. A Salad A Day Keeps The Doctor Away! I can’t stress enough the importance of eating vegetables, especially a nice salad, on a low carb keto diet. Vegetables contain vitamins and minerals as well as fiber and water which help us feel full. A healthy salad provides adequate amounts of protein and fat through the addition of meats-fish-shellfish, cheese, eggs, nuts and seeds, and full-fat dressing. Even a large salad is low in carbs when modest amounts of low carb vegetables are added. If you can take the carbs, try adding a few berries for a burst of tart-sweet flavor. Make it easy on yourself and automate your food. A crustless quiche can be enjoyed all week. A quick batch of soup is great for a hot lunch or for dinner. Meatloaf is perfect for dinner and as a leftover lunch. Use up any stray vegetables on friday or saturday for a quick stir fry meal. Shop for the week on Saturday and cook on Sunday. Marinate and cook the protein used on salads for the week. Wash and chop the lettuce. Rice a large head of cauliflower to accompany dinner as a rice substitute. Make a quiche to last all week or prepare you breakfast and lunch the night before so it’s ready to bring to work. *Remember that good food/ flavor will keep you interested in the diet. If you enjoy your meals you will want to continue. So you’re convinced you want to start, but you want to know how to start a low carb keto diet. It’s easy – just eat! It takes 3-5 days to deplete the glycogen stores in your body and switch over to using fat for fuel. There’s no need to starve yourself to lose weight. Here are three typical days of food for a mildly active woman. For 30 easy Keto dinner recipes with five ingredients check out Tasteaholics Dinner in 5 cookbook. They also have a lunch and breakfast cookbook. I have been eating Keto for 4 months, only lost 10 lbs. I dont cheat, I don’t eat any bread, potatoes, rice, pasta and no sugar. I eat real food, only can I open is for tomatoes. any idea what Im doing wrong? Hi Mary. First, I am not a health professional so I can’t give you dietary advice, but I can share some things that I have found work for me and others. Do you use a food tracker like Fatsecret.com? I highly using a tracker/food log to see just where your calories, fat, protein and carbs are. Some people’s metabolisms are resistant to losing weight. Those of us who experience the most resistance are those who have dieted multiple times in the past. Our metabolisms are broken and need time to heal. Age and how much muscle one has on one’s body also affects how much and fast we lose, as well as any medications. I have heard of friends stalling with dairy or nuts. And, some people eat too little calories while others eat too much. It’s all individual and depends on personal body chemistry. Tracking you food will allow you to experiment with eating more or less (calories, or fat, or protein) and seeing how it affects you. First, I would sign up with Fatsecret.com. I really love this free site. Second, I would buy one of the original Dr. Atkins books (they can be found cheaply on Amazon). The Induction period of Atkins is keto and also an elimination diet. Many people start low carb/keto with out knowing the “why” behind the diet. Dr. Atkins supplies the WHY. He also has people add back foods in a systematic way to look for food sensitivities and cravings. I suggest that you only weigh once a week and don’t get hung up on the numbers. Take the measurement of your upper arm, bust, waist, hips, and thigh. Check them every two weeks. Sometimes our bodies are changing in composition but it isn’t reflected on the scale. How are you feeling? How are your clothes fitting? All of this should offer some indication of how well a low carb or keto diet is working for you. Be careful of sugary foods like onions, garlic, and tomatoes. Some people use as much as they want in their recipes. One ounce of onion (1/4 cup) is almost 2.5 net carbs. Protein can pose another problem – this is not the unlimited protein diet. A woman should have about 3-4 oz of protein per meal, a man 4-5 ounces. Make sure you are eating good quality fats; butter, olive oil, avocado oil, coconut oil and not safflower or canola oil. Limit cheese to 4 ounces a day and heavy cream to 1/3 cup a day. I hope some of this helps. I think that tracking what you are eating and seeing how it affects you is the way to go. You may be a slow loser, but if you are happy with the food, not hungry, have energy, and feel good, then in 4 more months you may be down another 10 pounds or more! The scale IS going down and that is a good thing. Have your health markers checked in another few months and see if they have improved. Many people experience their cholesterol number going up, but you have to look at the breakdown, not the overall number. You should see an increase of good cholesterol. Just having a total triglyceride number tells you nothing. You need to know particle size. Large and fluffy cholesterol is by all accounts benign. Your sugars should have improved after 6 months and perhaps your blood pressure has improved, too? Is IF necessary for a Keto diet to work? Also, can I eliminate ALL carbs (rice, pasta, bread, low carb wraps, etc.) other than those that come naturally from fruits/veggies etc. and still be successful? Hi Anna. I’m not sure I understand your first question… I get asked how to start a keto diet all of the time so I thought I would put all of the information I get asked into one document – this post. You don’t have to calculate macros for a ketogenic diet to work (as I mention), but many people feel like they want to keep track for fear of doing it wrong. Other people don’t count carbs, they just eat while eliminating the foods you mention – and it works for them. However, there are some who are sensitive to some foods and they need to track what they eat or track their macros to find out more information. One man saw his blood sugar rise each time he ate vegetables. Another person found that red meat caused a rise. Others report that dairy sets them off. Then there was the man who said he ate no carbs and couldn’t figure out why he wasn’t losing weight. He ate 4 eggs and 4 sausage patties at breakfast, 4 hamburger patties at lunch and a big old steak for dinner. The excess protein he ate converted to glucose in his body which raised his blood sugar and caused him to continue to store fat. by IF I meant intermittent fasting…is it an essential part of the keto plan? thanks! Oh, duh. I’m sorry about that, Anna. Lol. No, IF is not essential for keto. Reducing net carbs to 20 should be good enough. Some people don’t worry about their net carbs, they just eat keto foods and are fine. Most people pay attention to what they are eating and track carbs so they can see how their body reacts to foods. I’m just getting started on building a new diet lifestyle for myself upon doctor recommendation. My initial research led me here. Thank you for upbeat leadership on this topic. I no longer feel so adrift. How did your family adjust? I am guessing you took them along with you. That’s an obstacle I face.